Alanis Fate Stay with Me LMR-10-12. If you have any questions just ask. I HAVE OVER 10,000 RARE NORTHERN SOUL & ROCK 45 PROMO’S I WILL BE LISTING. SS (STILL SEALED) Sealed at factory and never opened. Disc is assumed to be undamaged and mint, but this cannot be proven until the album is actually opened and the disc examined. M (MINT) Perfection, no flaws, defects, marks or otherwise indications of being handled or played. Any scuffs, hairline scratches or other marks disqualify discs from this category. I typically will not use this grade, as even new records have some type of flaws. NM (Near MINT) The vinyl is virtually flawless, bright and shiny. A very minor, barely visible scuff or two may be permitted, but no scratches. The disc should play with no audible noise. The label is bright, clean and unmarked. VG++ (VERY GOOD ++) Disc plays near perfectly, but may have minor paper scuffs that do not interfere with the sound quality. There can possibly be a hairline scratch or two but nothing that is obvious or affects play. Vinyl is bright and shiny; label is clean and unmarked. VG+ (VERY GOOD PLUS) Some visible surface wear, very minor scratches and scuffs, but minimal impact on the sound quality. Vinyl will still have good luster; labels may have minor imperfections small labels or initials, etc. VG (VERY GOOD) Vinyl will have noticeable scratches or scuffs that cause minor surface noise, but do not overpower the music. There will be no skips. Vinyl may appear somewhat dull and grayish. Labels may have small tears, tape marks, larger writing, etc. But still easily legible. G (GOOD) Well-played, dull, grayish vinyl with deeper scratches and wear causing distracting surface noise (hisses, pops, cracks and other nasties). The record will still play through without any skips. Labels may be significantly defaced or damaged. SS (STILL SEALED) Album is still in the factory-applied shrink-wrapping. M (MINT) Absolutely perfect; no corner dings, marks, tears, dents, impressions from the disc, or other flaws. NM (NEAR MINT) Very minor signs of wear or cover impressions. Artwork is as close to perfection as possible. VG++ (VERY GOOD ++) Minor disc impression or slight corner creases, no wrinkles, puckers, seam splits or writing on the cover. Artwork is clean and unworn and there is no ink wear. VG+ (VERY GOOD PLUS) Cover is clean but may have minor writing or marks and may show slight wear. There may be just the start of ring wear, where the disc has created a raised area on the cover that resulted in the ink wearing off the paper. There may be slight discoloration or staining, minor seam wear, but no splits or tears. Corners may have small creases or fraying. VG (VERY GOOD) Covers are worn and used. Seams may be starting to split. There is moderate ringwear, but the artwork is still attractive. There may be yellowing or discoloration and there may be larger writing, labels, or marks. Corners may have damage or creases and there may be scratches or gouges that otherwise damage the artwork. G (GOOD) Seam splits, large marker writing, major seam splits, significant ring wear, damaged corners, tears, cuts, gouges, masking or duct tape seam repairs, or other flaws and damage. 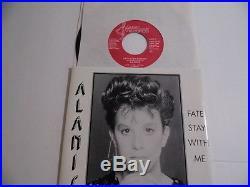 The item “Alanis Morissette VERY RARE 45 Fate Stay With Me ORIGINAL 7 Lamor Records” is in sale since Saturday, July 09, 2016. This item is in the category “Music\Records”. The seller is “gman2379″ and is located in North Branch, Michigan. This item can be shipped worldwide.